Virtual Paintout - Gothenburg, Sweden! I always love participating in Bill Guffey's Virtual Paintout each month. Bill selects a location somewhere in the world that Google Street View vehicles have covered. Anyone can virtually walk around and choose a view to paint, then submit to Bill, and he posts the artwork on his website and Facebook. I've been able to "visit" so many places that I'll never get to see in person. 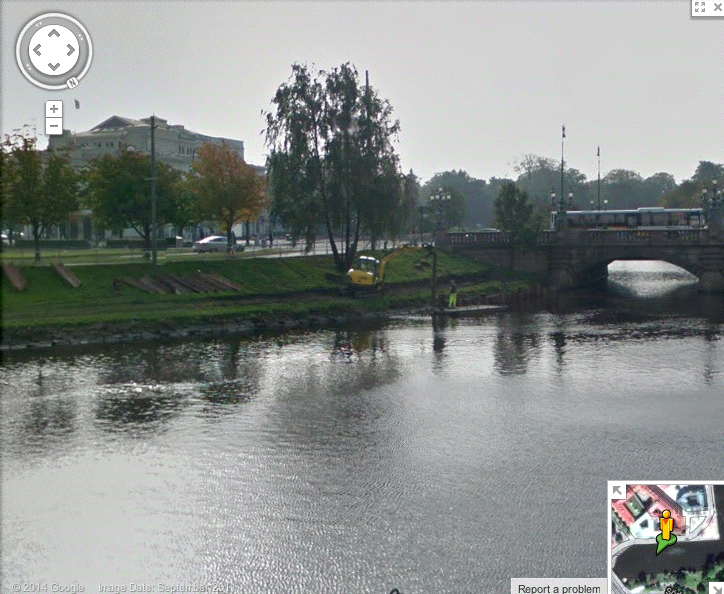 The location for September 2014 was Gothenburg, Sweden. I never have enough time to look around as much as I would like to. I want to check out downtowns as well as rural areas, and harbors. Gothenburg didn't seem very busy or crowded. 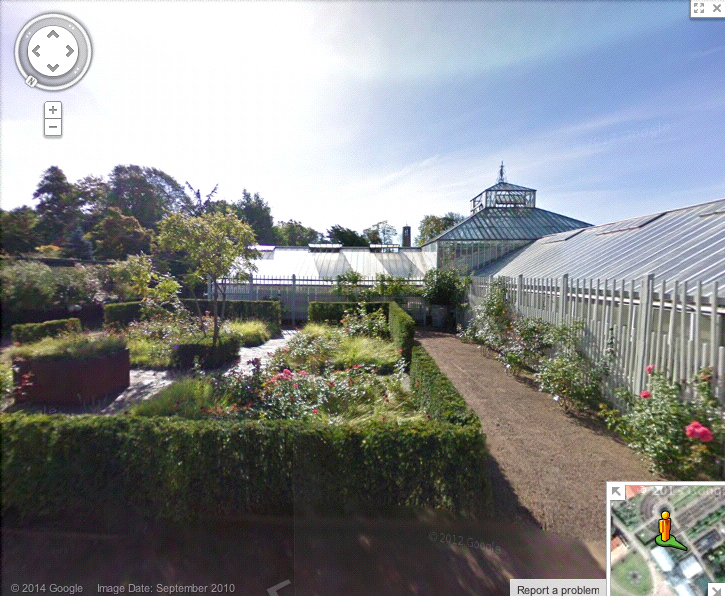 I ran across a large botanic garden with greenhouses that I wanted to try. And I found a canal running through an older picturesque area which made it hard to choose just one view there. Looking forward to next month! 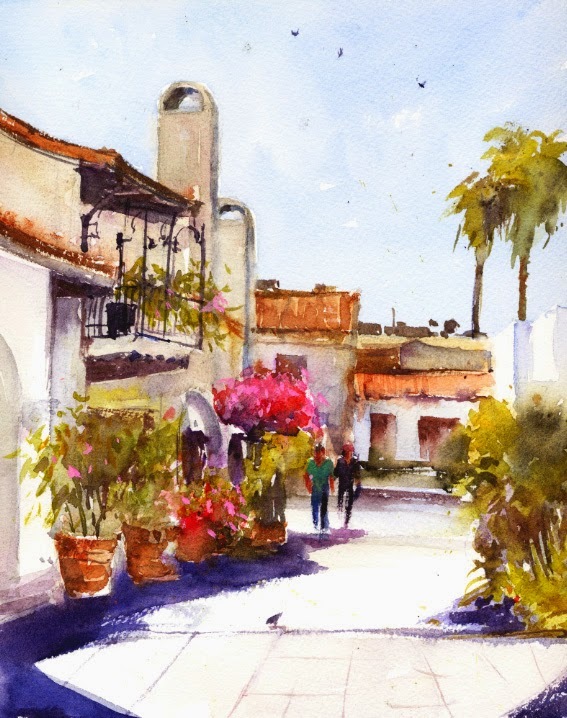 This month I was able to attend a workshop with David Taylor in Santa Barbara, California. I had been looking forward to this for a long time and I wasn't disappointed. Meeting David and watching him paint was such a treat. 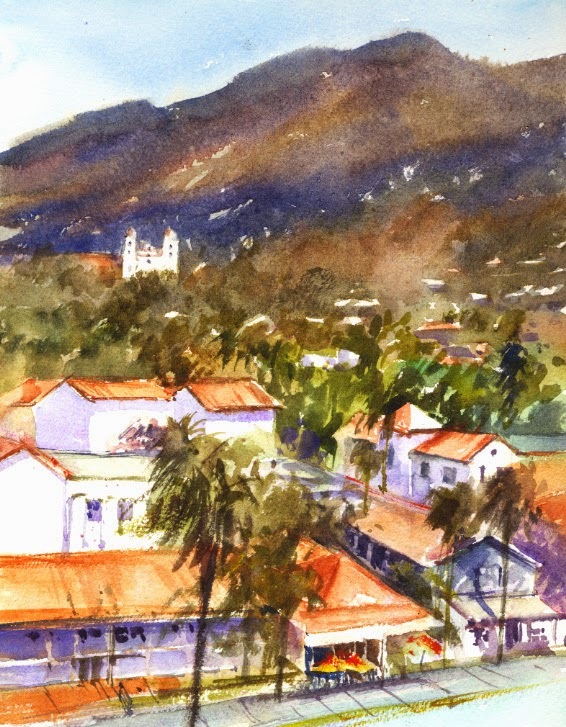 David painted two demos a day for the 5-day workshop and each piece captures the feel of Santa Barbara. And I must say Santa Barbara looked stunning, every building perfectly adding to the ambiance. I found David's way of teaching to be very helpful and he was so generous to us with his time and expertise. Our first morning was a little overcast and we were on the beach, painting two different views following David's demos, morning and afternoon. Painting on the beach was a new experience for me and trying to paint two pieces a day is a push. On Tuesday we met at the marina and David painted two gorgeous demo pieces. But for me, boats and water, I need more practice on those two subjects! I won't finish the two pieces I started. We were up in the tower at the landmark courthouse building on Wednesday. We painted street views Thursday and Friday. Thursday, late evening, we were lucky to have the opportunity to watch David paint a night scene. Wow, so interesting to see how he went about it. 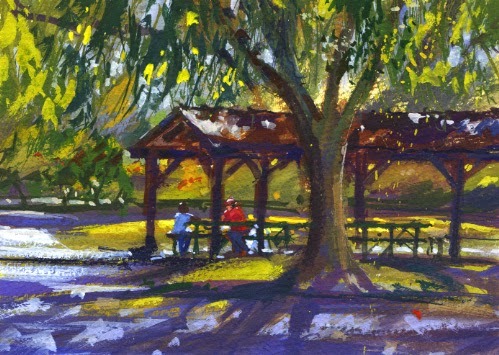 Our Saturday plein air paint-out group visited two small parks recently. And I painted two small gouache pieces. It's so much fun to paint and chat a little with friends while watching some busy Saturday park activity. So here are Grant Park and Singer Park, both in Pasadena. 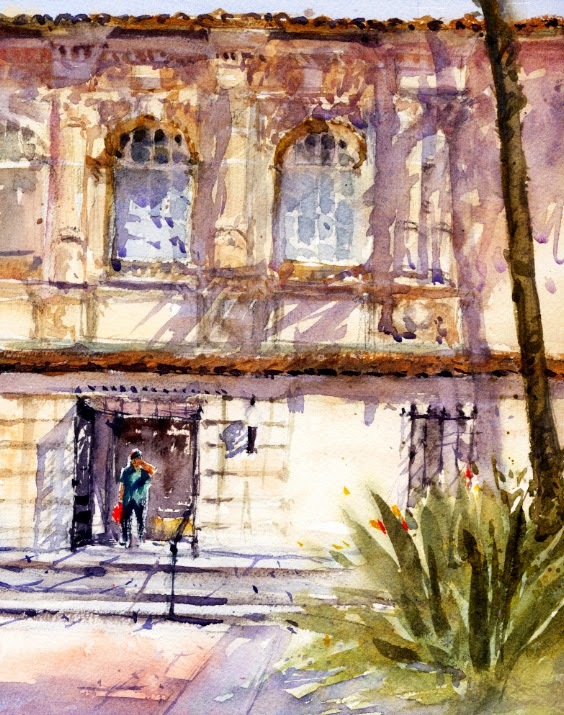 On a warm day last month our Friday paint-out group met at the Pasadena Central Library. I painted there a few weeks before with another group and posted that piece in Lilies of the Nile. 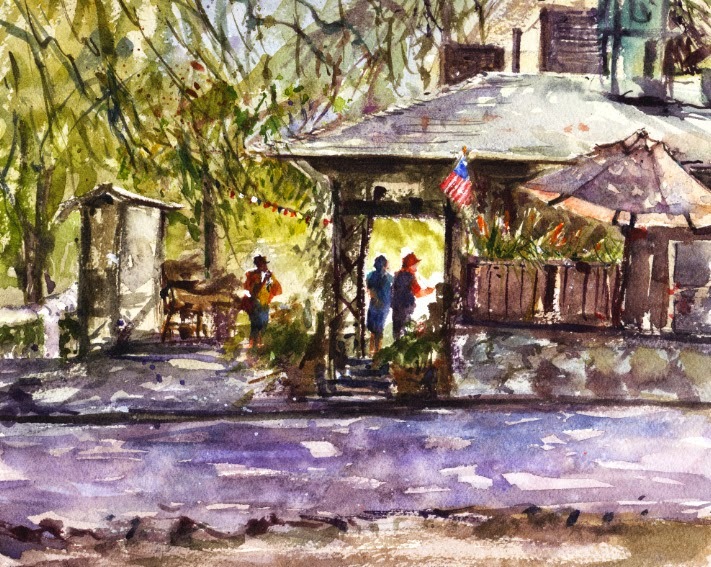 We all met in the beautiful library courtyard and since there was shade, we stayed in the area to paint. I stayed with the group even though the main building's facade is very ornate. I can get overwhelmed with such a complicated building but I try to remember what Joseph Zbukvic says, "Indicate, don't state". Okay, the perfect time to practice this! A library visitor came out of one of the doors and I was inspired! 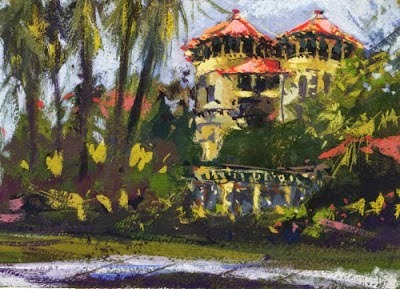 In July our Saturday paint-out group met at the Self Realization Fellowship Center at the top of Mt. Washington in Los Angeles. The last time we were going to paint there, the gates were closed in preparation for a private event. A few of us stayed in the lovely surrounding neighborhood and painted a craftsman home across the street. I posted that gouache piece in Mount Washington. The SRF Center was open for our recent visit and it was busy that day. 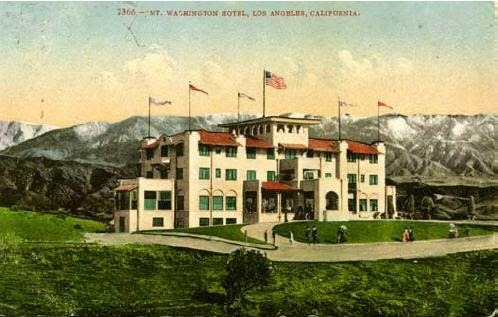 The Center's headquarters are in an elegant three story building which opened in 1909 as the Mount Washington Hotel. The grounds are peaceful and beautiful, but there were many visitors of all kinds on the paths. One feature I remembered from our paint-out there in 2012, was an enormous planter with bas-relief figures, planted with bright pink coleus. It was still there so I had to try it. I chose gouache since the day was overcast and it dries faster than transparent watercolor. A beautiful spot. The view of downtown Los Angeles from the center. We had a fun location I'd never visited before on the paint-out schedule recently. It's the Trails Cafe on Fern Dell Drive in Griffith Park. The cafe is really sort of an updated shack. On a Friday it was very busy. What a picturesque spot, which felt like being in a woodland with all the old trees. For my watercolor I chose a view from the north side, looking through the order counter area. Customers there were silhouetted in the light, and surrounded by the darker building and trees. I wish I could have included the Trails sign, but it was too far away. Next time I visit I'll try a snakedog and organic apple pie! I'm starting off September with something different. 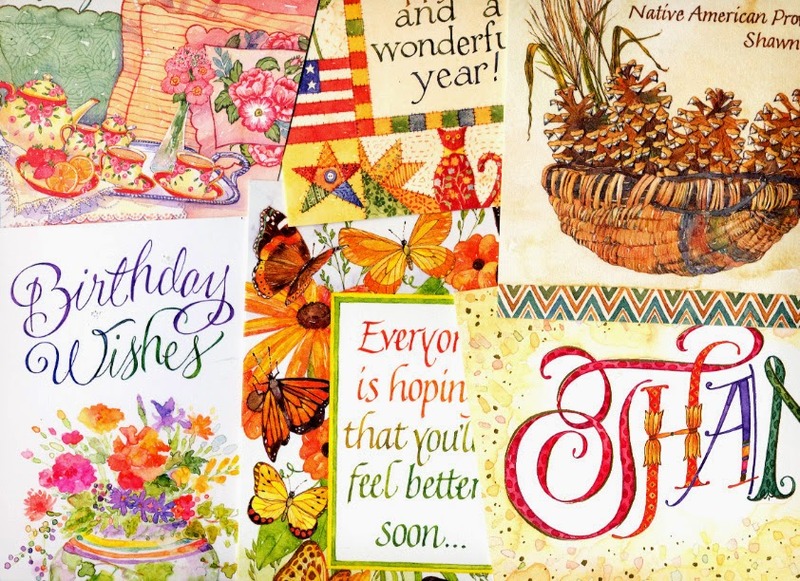 A few weeks ago my friend and fellow (fabulous) watercolor artist Brienne Brown asked me to be a part of an "Art Blog Hop". Brienne posted links to my blog and two other artist's blogs along with answering some thoughtful questions about her paintings. In turn I do the same, answering the same questions and linking to three other artist's blogs that I find inspiring. I'll start with the questions, which are ones I usually don't think about! 1. Why do I create what I do? Although I haven't met Brienne in person, we share a love of plein air painting, painting outdoors. 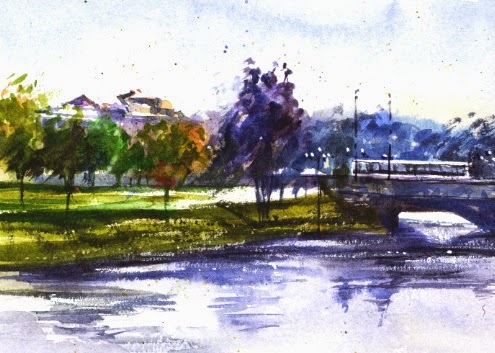 Watercolor was always the medium that I was drawn to and had a knack for, and plein air painting seemed to be the perfect means of expression. Since finding several local paint-out groups, it's been a big change for me. It's just what I've always wanted to do. While I'm outside painting on location with a group, that's all I'm thinking about. So much fun and so peaceful. 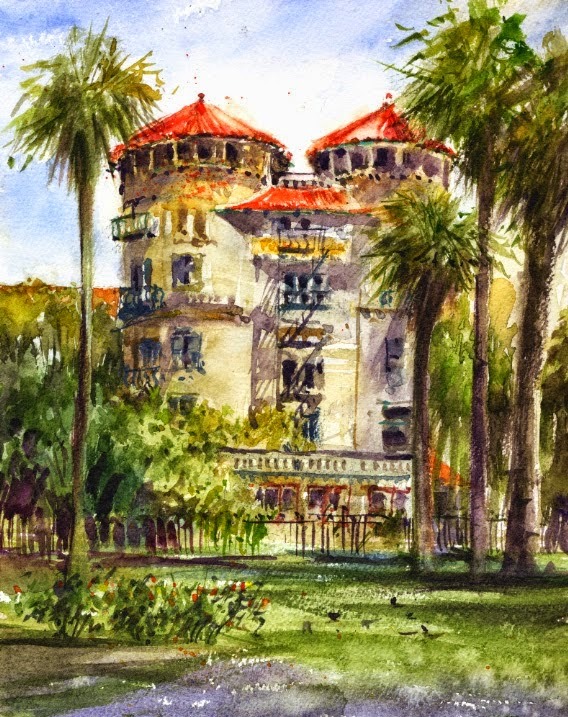 This is a recent piece of the Castle Green Hotel in Pasadena, California which I think turned out well, where a couple year's plein air experience felt like it was finally working out. During all those years of working in commercial art, I just KNEW plein air painting was what I really wanted to be doing. Since the greeting card work trickled away, if I hadn't found local paint-out groups, I probably wouldn't be doing much painting today. 2. How does my creative process work? 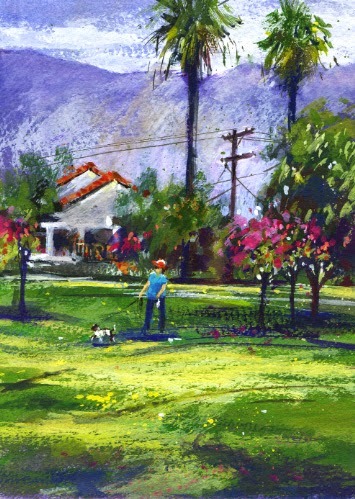 Plein air painting is a very personal and expressive way to paint. Arriving at our location, I spend quite awhile walking around, getting a feel for the area and taking some snapshots of possible views to try. Of course I look for certain subjects that appeal to me. There are also sun and shadow, and color to take into account. It took me some months to learn that what helps my paintings a lot is to have a foreground, middle-ground, and background in my choice of what to paint. I think my paintings differ just as everyone else's do. We all have a certain way of applying our paint. Our brushstrokes differ as our handwriting does. I do like to use some drier, fast brushstrokes where I can. Our attention to certain details (like architectural) and our loose or "tight" style varies with each of us. I've been told that I have a certain color range, which seems to only be the colors as I see them! Of course I'm always working on improving my watercolor techniques. It seems there is always so much to learn. The medium is challenging so there is always something to strive for. Seeing other artist's pieces, in watercolor, oil, or even pastel, I see things to try. Also, for almost two years I've been experimenting with gouache which is opaque watercolor. It's another challenge but I'm enjoying the results. Here is a gouache piece of the same Green Hotel as my watercolor above. Now for some fun, adding links to three blogs that I find inspiring! The first has to be Frank Eber's blog. 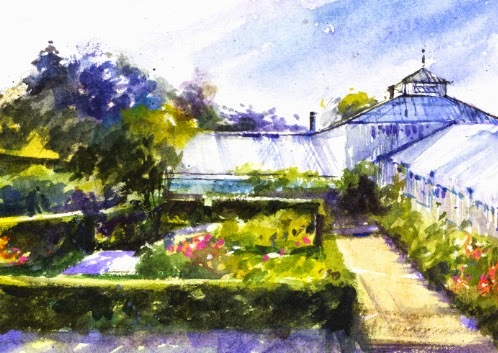 I took a 3-day workshop from Frank early in my new, non-commercial watercolor direction. 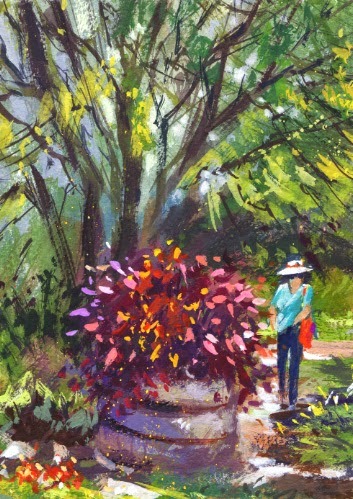 I had not found any plein air groups when I took that workshop and I was learning so many new things. Thanks to Frank's blog I have inspiration and reminders from him with each of his posts! He's such a generous teacher as well as wonderful painter. 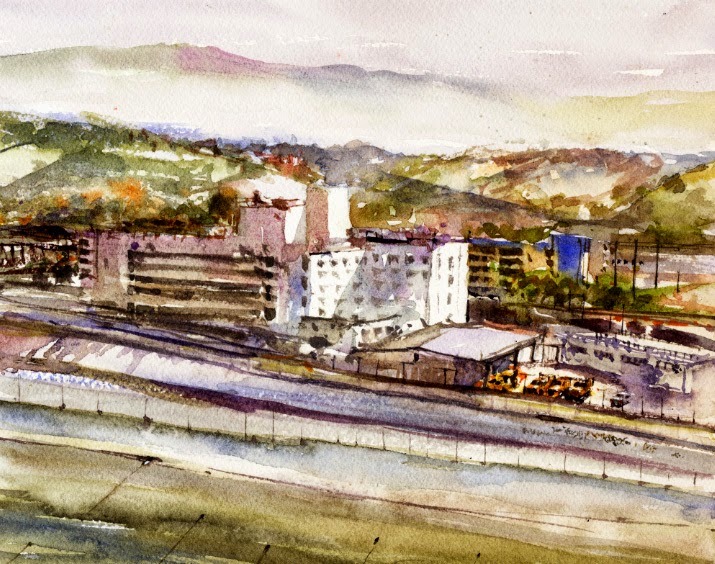 His watercolors are something to study. 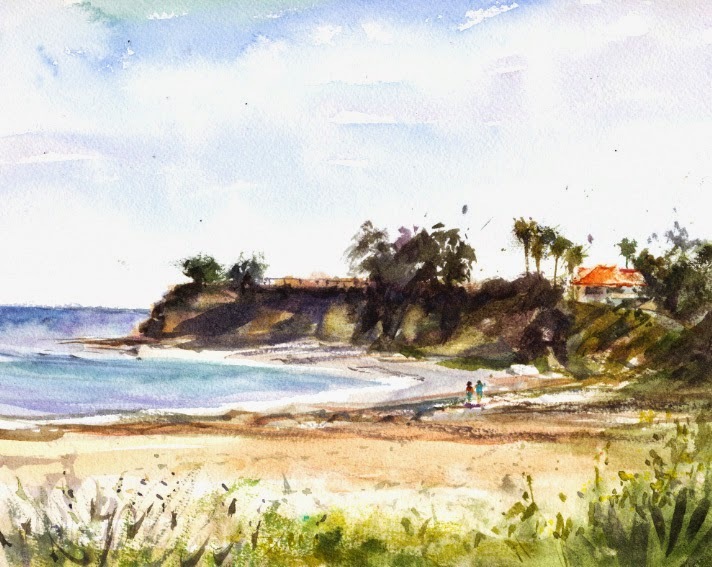 The next two exciting blogs are written by friends I "met" in an online watercolor class a few years ago. My friend from South Australia, Lorraine Brown, paints such a variety of subjects from florals to animals. Her approach to pieces can be an adventure in mixed media techniques, very exciting. And Lorraine is usually working in a series, an inspiration to me. I haven't attempted that yet! Here is Terry Freemark who paints figurative watercolors inspired by everyday moments. Terry is expert at capturing her subject's subtle looks and gestures. Her pieces are always filled with emotion which is something I'm trying to work into my landscapes if possible. I'm grateful to know these three artists, and Brienne too of course! It's been fun to think about the tough questions and my inspirations.